It’s 5am and I am still up and awake – haven’t slept yet. Call it insomnia tonight, call it maybe a little anticipatory about going session this morning, in just a couple of hours. Maybe it’s being awake because right now I am feeling pretty good and I want to embrace it as long as I can as these good moments have been far and in between in the last month or so. I am blessed with not having any sleep issues, and never really had trouble sleeping in my adulthood. So when I have these moments of “awake”, I like to look at it as “inside energy” – so I decided to use this to write. I think a big reason why I am still up and awake is because of the intense but good session I had yesterday. There was some movement and I had big emotions, and maybe a part of me is a little vulnerable and still open and raw to those emotions I had. There is some anticipating how walking into session this morning will be like. Will big emotions show up again? will the work be as hard, or harder? will I have more movement or will I walk in and the weight (silence) show up? Maybe I am awake because movement has happened inside and I am feeling a little room for some open time for myself and not wanting to isolate to the usual routine I have been going through in the past 2 months. Maybe there is a small part of me that is awake for my husband as he is nervous doing a huge presentation over video to china in the morning and it’s a pretty big deal for him. …. or maybe it has something to do with my teen boys being up and they are a little loud because it’s spring break and they are teen boys (no explanation needed there), although they can be loud, there is no better sound than happy boys enjoying their spring break. My therapist and I are working on something pretty big in therapy that I look forward to sharing with you all when the time is right, and I am almost willing to bet that my lack of sleep tonight is the many thoughts running through my mind having already taken a step towards something big yesterday. I feel a little raw and vulnerable to my emotions yesterday, but at least it was movement towards something and that is good. So as I sit here and write late in the night or shall I say early in the morning…. I will pay attention to this little moment of energy I have right now, and I will embrace it as something important; something to pay attention to. I love that I decided to write in my blog at this time – another thing I wouldn’t normally do at 5am. I am sure I will be dog tired in a couple of hours…. so I will try to shut my eyes for a few hours, and later on after all my appointments of the day are over, I will care for myself and take a nap to get some rest while I can, and pay attention to what is here right in the moment. I have to say, it’s been a long time since I have pulled an almost all-nighter” (not as easy as it was a long time ago). I am sure my thoughts on this in a couple of hours from now may be much different, and I may even cuss saying “what was I thinking?” .. but I will just open my blog and read what I wrote and say “ahh ok, it was so worth it” .. “this was different, this was connecting, and being awake in this energy is something to pay attention to. There is something special about this time when the world around me still seems asleep. My cat likes to get up right about now so that’s probably the reason for my early wakening. It’s good to hear that even though you feel emotionally raw and vulnerable that you also feel a positive anticipation for what’s next in your therapy. What a great combination. 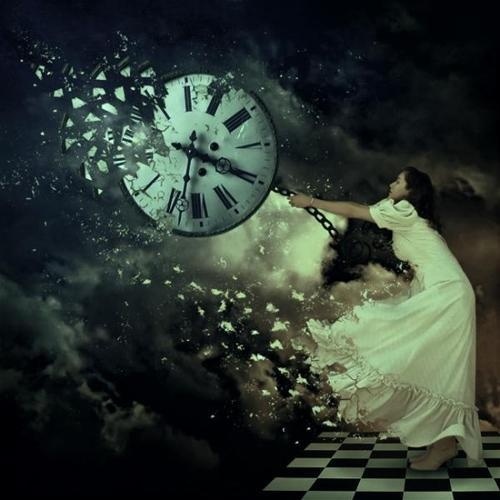 That image of the lady trying to harness the clock/time….I’ve been feeling that lately….or maybe she is trying to slow time down…not sure. Hearing that you go to therapy several days a week makes me remember that I have the option to set up Co-Counseling appointments with different people from my class – as many as I want. So I could try that – having more frequent sessions. It doesn’t cost (except for the time) because you set up an equal exchange. I think the time factor is the only thing that really gets in the way for me. I had a break through in my session yesterday and part of it was feeling like I found ‘the door’ open to my inner releasing of feelings. I know it is partly because I found a person who I’ve built trust with. And partly I guess I’m just ready to go deeper. Trust is SO SO important in the therapeutic relationship. I think you know all about that. And trust takes time to develop. Best wishes to you Karen. Hi Gel! Yep… it’s 2:00pm and I am still going on hyperdrive on 2 hours sleep lol .. I’ll crash later..
You know, when I first started therapy I went once a week, we call it TT (tuesday at ten for two hours) .. it’s been my time for 6 years. As I progressed in the hardness of therapy we bumped it up to 2 times a week.. and then it got REALLY hard and eventually it turned into 4 days a week and we have a routine.. Monday is 1 hour we connect around the weekend and what our expectations are going into the week. Tuesday is the 2 hours and we do most of our work on Tuesdays.. Wednesday I have off and take that whole day just for myself to relax and be by myself. Thursday we connect around the hard work we did Tuesday, and then Friday is sometimes 90 minutes before the weekend and we do more hard work. In between we talk on the phone and write an email to each other every Sunday night. It seems like a lot, but there are 24 hours in a day, I live outside in the outside world more than I am healing. Having this routine and having my insurance cover it is what got me to where I am today. I work VERY hard in therapy! I dont show up just to show up. I dont quit when things get hard, I work IN therapy and OUTSIDE of therapy. I am in it to heal and it works. My therapist says to me a lot “you are the most dedicated healer I have ever met” .. I want more than anything to get better and I use all my time USEFUL. The healing doesn’t stop when I leave after a session, the healing continues even in my writing, through my relationship with my kids, my husband, my home life.. I am always working hard! I take vacations in the summer an the weekend gives me a lot of good space.. and when I feel it’s too many days during the week, I know I can back off one day anytime I need to. The whole key it “it’s my choice”. I say if you have the ability to heal an reach out and heal more, DO it.. YOU ARE WORTH IT.. and I am worth the 4 days a week I show up. That little child that I was who ha no one, she has support now and I Will do whatever I can to make this healing path as successful as I can. GOOD for you Gel for looking into going more.. Thanks for explaining about your frequency of therapy sessions. I’ve been wondering for a while since I’ve never heard of going that often. I’m not judging you about it. I’m a bit envious. I’m proud of you for making that level of commitment to your healing. And I’m happy for you that you have the resources to make it happen.